Right now the Terps are hot. They've won 7 straight ACC games, and just completed their best regular season record since the national championship season. The national champ Terps went 15-1, losing only at Duke. These year's Terps completed a 13-3 regular season with a nervy 74-68 win at UVa on Saturday. How good is this 13-3 record? Well, in all of the seasons combined since the national championship, Maryland had a .500 record in ACC league play. This season, they are 10 games over .500 in the league. That's not just good, it's great. It's "Gary Williams is the ACC Coach of the Year" great, and "Greivis Vaquez is the ACC Player of the Year" great. And it might even be, "Jordan Williams is ACC Rookie of the Year" great. Those awards won't be announced until tomorrow, but I think both Vasquez and Williams have earned them, edging out Duke's Scheyer and Coach K. None of this is news to Maryland fans who have been paying attention, but it's new news to the college basketball nation at large, which is just now, in mid-March, getting an eyeful of the Greivis-led Terps, who jumped to 19th in the ACC and ESPN/USA Today polls out today. Also today on ESPN.com, bracketologist Joe Lunardi slotted Maryland with a 5-seed, the team's highest projected seed yet. So my next question is this - what if Maryland wins the ACC tournament? They'd be 26-7 and riding a 10-game winning streak, that would likely include another win over Duke, the only other ACC team that's currently ranked (4th). Jordan Williams has emerged as a true force inside averaging 9 points and 8 boards, and doing his best work during this late-season winning streak. Williams has very strong hands and gives Maryland an inside presence they've lacked since the Lonny Baxter years. He's very similar to Baxter actually. I'd say a little better rebounder and about the same offensively. Lonny was a better foul shooter. Greivis has been off the charts for six weeks now. Last year, I didn't think it was a good idea for him to come back for a senior year. After all, he turned 23 this year, how much better was he going to get? What happened was that his teammates improved, he got hot at the right time, and has emerged as one of the elite PGs in the country. GV is the ONLY point averaging more than 19 points and 6 assists right now. If Maryland makes a deep run in the tournament, he has a chance to displace Juan Dixon as the program's all-time leading scorer and he's a lock to pass Bias to get to #2. Add to those career numbers his heroics against Va. Tech, UVa, and just about everyone else, and it's time to stop and say, "this guy is great." I've turned the corner on Greivis. It took 3 and a half years, but I now love the guy and you should too. Gary has a well-defined rotation. Dino Gregory is the first big man off the bench; Tucker and Bowie are a great 1-2 scoring punch off the bench in the backcourt and wing; and James Padgett is there to consume some minutes if any of the big men get in foul trouble. The starters all have well-define roles and let's hear it for the steady hand of Eric Hayes who, like GV, is having an inspired senior year, making good decisions, making key shots, and playing, in general, great basketball. So... back to the quetion - what if Maryland wins the ACC tournament? It kinda depends what the teams in front of them do... because it's a bit harder to push through the field from the back, as opposed to hanging on to a spot near the top. But... for my money, Maryland is a 3-seed if they win the tournament. There's still a good amount of doubting out there about these Terps, and I think a run from not ranked 2 weeks ago to a 2-seed might be too much to ask. But get Maryland in as a 3 and let's see what happens in the Dance. One thing is for sure, it's going to be fun to watch. Who am I kidding? We will all be nervous wrecks. Except for Greivis, he seems to have this thing figured out. 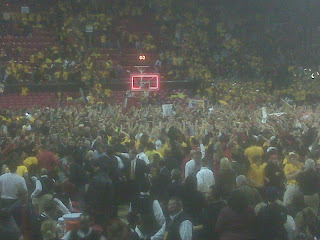 Special thanks to Terps fan Big Russ Dlin for sharing this post-game shot. What a win. I made a video that day and cut it up into four parts, so here they are. Forgive the shaky camera .. but if you skim through it you get a great flavor for the sights and the sounds of an amazing facility.